I have wanted to visit the Wintles in Bishops Castle in Shropshire for many years. 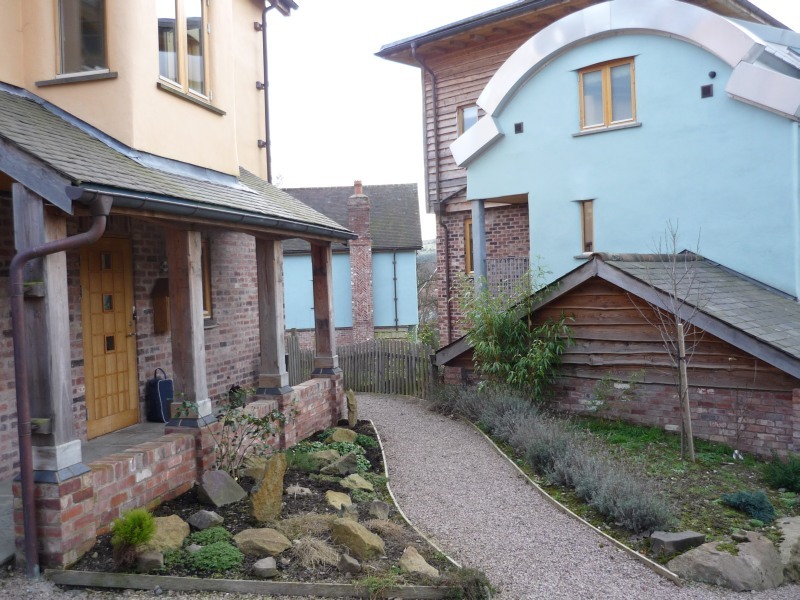 It has won many awards over the years as a pioneering ‘green’ housing development. I knew its creators, Bob and Carol Thomlinson, many years ago, and followed the project’s early stages, including its design phase. It was conceived of as a low energy, sustainable housing complex, one that was designed in such a way as to create a strong sense of community. Last week I was in Bishop’s Castle for a talk (which went very well), and finally I was able to have a good look around the place and see how it had turned out. Bishops Castle is one of the UK’s most beautiful small towns, complete with gorgeous timber framed houses and small streets. It has also long been a community of creative ‘alternative’ types alongside a more traditional rural community. The Wintles is situated on the edge of the town, on land that was already zoned for development when it was bought by Bob and Carol’s company, Living Villages Trust, in order to develop it as The Wintles. The first phase featured a number of houses around a small village green, the second a further collection of houses on the hillside behind the first, and then a third phase behind that. So far the first and second phases have been completed, with the third still unfinished (more on that later). As well as the houses, the development also features a community orchard and an area of allotments, which each resident it entitled to. The design phase of the project intended to create a deep sense of community and at one point, architect and author of ‘A Pattern Language’ Christopher Alexander, had some design input, and was one of the key sources of inspiration for the design approach. The estate was designed to be car-free (cars are kept to the edges of the development), as energy efficient as possible, and designed in such a way as to maximise the sense of community cohesion. The provision of allotments means that individual gardens are smaller than one might expect, and the houses are close together. The Wintles features a range of different house sizes, from smaller bungalows to larger family houses, with various other designs in between. They all have solar panels and are built to very high levels of insulation, as well as being designed to maximise solar gain. They are also very beautiful. On first view, one is struck by the creative mixture of different materials, stone, brick, timber, plaster and tile, as well as the use of colour. The whole development feels very pleasing to the eye and also very welcoming and comfortable. I arrived at about 4pm, and had a bit of a wander around. I hadn’t been there long when Pat Robinson, one of the residents, came out of her house and asked if I would like a tour around her home. She showed me both around her place and one of her neighbours houses’, who was away and which she was looking after. All the houses I saw had solar panels, heat recovery units (that extract warm moist air from some rooms and use the heat to warm air going into cooler rooms), woodstoves and gas boilers as back up. They were all very well insulated, indeed the house we visited that was unoccupied had been closed up with no heating for a couple of weeks, but was still perfectly warm. Each house was beautifully finished with lots of natural materials on display. Then, another family over the road offered a tour of their house too, focusing more on the technical aspects of the energy systems. That house had an open space running up the middle of the stairs to allow warm air to rise, and was very light and beautiful. They told me that the house was so well insulated, and the stove so efficient that it only took 3 logs to heat the main room downstairs. Some of the detailing seemed a bit at odds with the energy efficient aims of the houses. The kitchens featured lots of halogen downlighters, which use a great deal of energy in comparison to their lower energy equivalents. Also, kitchens had been fitted with large gas cookers, but they were just one large oven, rather than two smaller ones, meaning that anyone wanting to heat up a small meal would need to heat the whole large oven. These choices, which were fitted into all the houses while they were being built, felt somewhat incongruous given the overall aims of the development. The Wintles recently ran into problems due to the economic contraction we are seeing, which as we know is hitting the housing sector especially hard. The third phase of the Wintles was half built, the houses weathertight but unfinished, when RBS, who were financing the development, refused to extend their loan any further and the project was put into recievership. As a result, the houses are unfinished and nobody knows how or when they will be finished (see right). They are stuck in limbo, with apparently some of them having buyers lined up, but no way of actually completing them, apart from a few that are being built by a local housing association. It is tragic but inevitable that the downturn in housing should also affect the emergent ‘green’ housing market. Those who I spoke to who live at The Wintles feel sure that the houses will be built, and that the receivership is just a temporary blip in the evolution of the development. What interested me was, having been aware of the design process and the amount of work that went in at an early stage to try and ensure that a strong sense of community was facilitated for those who moved in, whether or not that had actually emerged. Although it is a development that has only been in existence for a few years, and already some of those living at The Wintles are ‘second generation’ residents, the common response I got from those I spoke to was that that sense of community is already very strong. 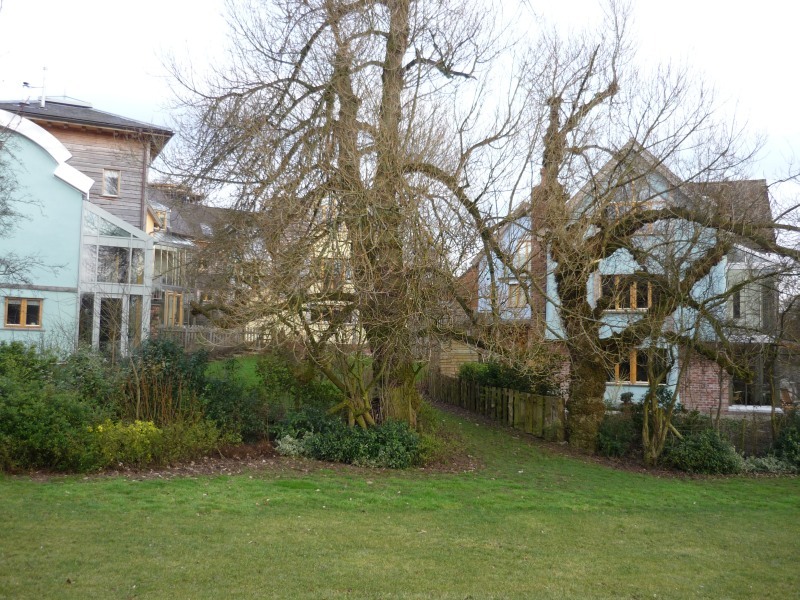 The village green is already used for lots of events and social occasions, and acts as a meeting place for residents. People help each other out with the allotments, and work together in many different ways. Of course it is hard to attribute the degree to which people form community, or conversely the degree to which they don’t, to the physical design of a settlement. However, it felt to me that that hard work put in at an early stage has paid off, and as a result, the place feels calmer, more welcoming, and more like a community than many other new estates built at the same time. Of course, such a development with all its green bells and whistles, comes at a cost. The houses at the Wintles are significantly more expensive than other houses in Bishops Castle, and as a result, those who can afford to live there represent a smaller cross section of society than would be desirable for a truly sustainable community. Indeed some might question whether ‘green’ developments like this can actually claim to be truly sustainable, given that in order to work they need to be sold at a price which excludes the large majority of the population. The hard reality is that developers such as Living Villages are unfunded and operate in the marketplace, and need to remain viable. It would be a great shame though if the insights, careful design, attention to detail and energy efficiency that are at the heart of this development were not also to become embodied in more affordable developments. However, that said, I was impressed. The Wintles is an experiment, and it has moved the discussions about sustainable building forwards significantly. Is it replicable on a very wide scale? In terms of design as if beauty mattered and energy efficiency yes, but in terms of that resulting in houses unaffordable to most, perhaps not. However, as a mainstream development that embodies the spirit of Pattern Language and which places a far higher priority on the need for beauty than most conventional development, this is an important place. It was a brave development by a visionary developer, one who took risks and who put their money where there mouths were, at a time when many other talked about the need for sustainable building but did nothing. Good review Rob. I hadn’t heard of this project. In my opinion, there is no intrinsic reason why ecological building should be more expensive than conventional building. In passive solar design you spend more on the building envelope in order to spend less on heating/cooling/a-c systems. Even using entirely conventional materials and building techniques, you shouldn’t have higher overall capital costs. Natural building (using eco materials like wood, straw, earth), on the other hand, tends to be labour-intensive, which means it’s expensive if you use skilled labour, but cheap if you treat it as fun work instead of tedious work, and people pitch in and help. That’s the way we’re doing our house, anyway, and it seems to work. We built our cabin (where we’re living while we build our main house) for €5000 in materials and zero in labour! But eco-housing, even if no more expensive to build, is still more expensive to buy. The fact that ecological houses are better places to live means that they command a premium in the housing market, which I suspect is the principal reason for the high cost of houses at The Wintles. That, of course, is a political issue, not a design issue. In general, the excessive cost of housing in most countries comes down to lack of legal access to land and building permission, which makes shelter an artificially limited good. The point you make, Robert, about a lack of legal access and building permission making shelter an artificially limited good addresses the broad political issue, the ‘all property is theft strand’. Another strand, of course, the ‘right to buy’introduced by Thatcher’s government. A lot of the council housing stock has been sold without a programme to rebuild new properties to replace those sold. Hence the present housing crisis. I facilitate the Crediton Area CoHousing group which operates under the umbrella of Crediton Climate Action (alias Transtion Town Crediton) and we aim to provide a cohousing eco development of two thirds affordable properties.The sub prime market also needs beautiful eco friendly, community minded developements. There’s alot we can learn from places like The Wintles, but the need, in my opinion, is to use this window of opportunity whilst the financial and environmental crisis converge to address the basic human need for shelter in an inclusive and visionary way. The cost and price issues Robert points out are all quite real- but in my opinion are artifacts of conventional bank accounting practices. Alas- we do not have a good accounting alternative; somebody needs to develop one. The vast majority of us look at “the bottom line” in these cost situations; and the books are rigged at the moment in favor of quick profits for builders and banks. Period. I went through this myself, when I financed and built my off-grid earth sheltered commercial greenhouse. The construction costs were about 4x standard greenhouse business costs, and the bank looked at me like I was nuts. I had hours of explaining “see, the heating costs for the next 20 years are actually included in these construction costs; likewise, energy bills for electricity are 90% upfront; no monthly bills (which often greenhouses to bankruptcy) will ever exist.” etc. Plus; don’t have to replace plastic covers every 4 years (glass)- etc. When I finally had the bank willing to look at; and SEE the bottom line for my business at year 20 – they WERE able to understand, but boy it was a lot of work. Re: the Wintles development; to my American eyes these photos don’t look that attractive; I want more trees. Which, incidentally, can cut energy costs in the houses, all year long. But- sure, a great effort. What’s the next one going to look like? Bob and I both felt your blog on the Wintles was sensitive and perceptive. The fact that you have been conscious of the process we have been through since 1993 allows you a clearer view of how it links to the result. We do feel the Wintles has been a success and when we visit we feel sense of neighbourliness and community. Residents talk about “friends” and neighbours who live nearby. We have always believed that the way to solve the energy, social, environmental issues is through community and friendship. And yes I do think that the way a neighbourhood is designed has a huge influence on how people interact with each other. To address the price issue: when the first phase of the Wintles was complete some residents sold their houses for about 100k more than they had bought them. About a year between the purchase and the sale. They made a huge profit and we were told by estate agents that we had seriously undervalued our houses. This raises the question of price. If you build a development that becomes desirable you will attract people who see that they can make a quick profit by buying and then quickly selling their house. What do you do about this? To address the light fitting and oven point you made: people had a total choice of the light and appliances they wanted. Up until recently there haven’t been eco options that were attractive enough to lure these customers especially in the kitchen, oven area. This is an area of industry that needs developing so that eco-houses can be more energy efficient and beautiful. Many of the people who bought our houses did so because they liked the look of them and the eco considerations came second. Re.Greenpas comment on trees. The first thing we did whilst waiting for planning permission to come through was plant 2,000 trees. The residents of the Wintles and Bishops Castle can now walk through and enjoy what is now an established forest. The labyrinth orchard of 200 trees gives an abundance of fruit which the residents love harvesting. As for the future of the Wintles we hope it will be bought by a developer who is sensitive to our ethos and who intends to complete it promptly and to the same standard. We are now using what we have learnt working on the Wintles to create the best example of a sustainable village that we can conceive of, in Scotland and will keep you posted.